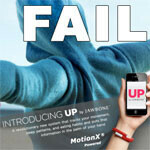 November 6th marked the release of the UP by Jawbone. The revolutionary health tracking system for the iPhone was intended to use a wristband and an iPhone app to track nutrition, exercise, and sleep. Apparently, it used the same wristband and app to aggravate and disappoint people. The UP wristband has been determined to have a flaw in two capacitors that significantly affect the charging and syncing performance of the product. Jawbone CEO, Hosain Rahman, has published a letter stating that Jawbone will be offering a refund for the entire purchase price for anyone who has experienced difficulties with the device. The refund is being offered as “No Questions Asked” and will run from December 9th, 2011 through December 31st, 2012. Customers will be able to go to http://jawbone.com/up/refund to submit a claim for a refund or a Jawbone credit. The only thing required is a serial number. Jawbone is actually letting customers keep the product AND receive a refund or credit. While you have to agree not to return, resell or collect money in any way through another source, if your UP is really a source of stress, it is hard to put a price on the joy of getting to smash a troublesome device. +1 if you read "track nutrition, exercise, and sheep"